Researchers from the University of Huddersfield, with colleagues from the University of Cambridge and the University of Minho in Braga, have been using a genetic approach to tackle one of the most intractable questions of all—how and when we became truly human. Modern Homo sapiens first arose in Africa more than 300,000 years ago, but there is great controversy amongst scholars about whether the earliest such people would have been 'just like us' in their mental capacities—in the sense that, if they were brought up in a family from Yorkshire today, for example, would they be indistinguishable from the rest of the population? Nevertheless, archaeologists believe that people very like us were living in small communities in an Ice Age refuge on the South African coast by at least 100,000 years ago. Between around 100,000 and 70,000 years ago, these people left plentiful evidence that they were thinking and behaving like modern humans—evidence for symbolism, such as the use of pigments (probably for body painting), drawings and engravings, shell beads, and tiny stone tools called microliths that might have been part of bows and arrows. Some of this evidence for what some archaeologists call "modern human behaviour" goes back even further, to more than 150,000 years. But if these achievements somehow made these people special, suggesting a direct line to the people of today, the genetics of their modern "Khoi-San" descendants in southern Africa doesn't seem to bear this out. Our genomes imply that almost all modern non-Africans from all over the world—and indeed most Africans too—are derived from a small group of people living not in South Africa but in East Africa, around 60,000-70,000 years ago. 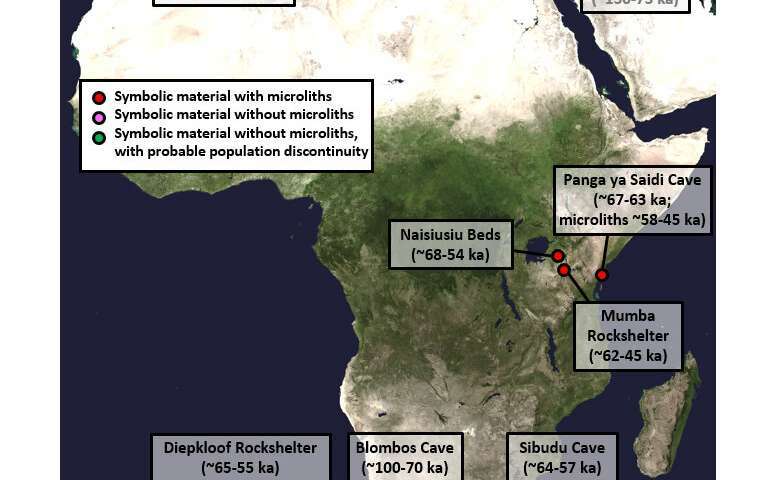 There's been no sign so far that southern Africans contributed to the huge expansion of Homo sapiens out of Africa and across the world that took place around that time. That is, until now. The Huddersfield-Minho team of geneticists, led by Professor Martin Richards at Huddersfield and Dr. Pedro Soares in Braga, along with the eminent Cambridge archaeologist Professor Sir Paul Mellars, have studied the maternally-inherited mitochondrial DNA from Africans in unprecedented detail, and have identified a clear signal of a small-scale migration from South Africa to East Africa that took place at just that time, around 65,000 years ago. The signal is only evident today in the mitochondrial DNA. In the rest of the genome, it seems to have been eroded away to nothing by recombination—the reshuffling of chromosomal genes between parents every generation, which doesn't affect the mitochondrial DNA—in the intervening millennia. In any case, it looks as if something happened when the groups from the South encountered the East, with the upshot being the greatest diaspora of Homo sapiens ever known—both throughout Africa and out of Africa to settle much of Eurasia and as far as Australia within the space of only a few thousand years. The article, A dispersal of Homo sapiens from southern to eastern Africa immediately preceded the out-of-Africa migration, can be found online in Scientific Reports. NO map available so I guess, a primarily fish eating coast settlement migrated eastward encountering another fish eating coastal group that by virtue of cross breeding increased intelligence and began expansion as this was briefly weather-permitted. How this expansion left Africa baffles me as there are NO COASTAL UPWELLINGS past Maputo so did they take the Rift Valley up to the Lake Victoria and then the Nile or did they go back to the west coast of Africa and then up and the coast utilizing ocean upwellings. Lake Victoria refilled during this period from a desiccated bowl at 14,500 y a. Humans evolved not in just Africa, but Asia and likely Europe as well. Acidic soils that characterize Europe would have destroyed any calcification (bone) that might have provide evidence for it. But the ranges of life (New Guinea, Australia) at the times they appeared prove there was no way African migration could have facilitated it. Interesting study, but there are too many uncertainties on how and where they migrated. We don't know anything on what happened during glacials at sea coasts which are now often more than hundred meters below sea level. We should not underestimate their skills, even at very early times. Not unlikely, Homo sapiens often migrated along sea coasts, and possibly they used boats. Neanderthals already colonized islands such as Cyprus and the Dodekanesos in the Mediterranean Sea. Much earlier, archaic Homo on the first out of Africa migration in the early Pleistocene had probably followed the coasts, google e.g. "Coastal Dispersal 2019 Verhaegen", and more than half a million years ago they had even reached islands which are far overseas such as Flores. "Only for a brief period at 60,000-70,000 years ago was there a window"
-and re your coastline notion, they were a lot different back then.